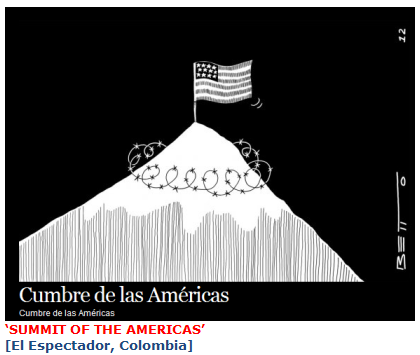 Will the Summit of the Americas, to be held in Colombia this weekend, call for drug decriminalization? Columnist Julio E. Mayaudon of Venezuela’s El Carabobeno writes that despite all the evidence supporting an orderly decriminalization, an alliance of sorts between the U.S. and more authoritarian states will doom plans for legalization: The U.S. opposes it, preferring to put the burden on producing countries, and countries like Venezuela have leaders with ties to the drug cartels. READ ON IN ENGLISH OR SPANISH AT WORLDMEETS.US, your most trusted translator and aggregator of foreign news and views about our nation.